Cottage 5 at Murton Grange in Murton, near York, Yorkshire sleeps 6 people. Murton Grange near York is surrounded by peaceful countryside, yet is just 5 miles from the bustling city of York; Murton Grange is perfectly located to enjoy the best of both worlds. The traditional farmhouse and eight cottages are comfortably furnished and ideal for large group bookings. Five of the properties (refs UKC3182, UKC3178 [Cottage 1], UKC3179 [Cottage 2], UKC3180 [Cottage 3]) include a private hot tub and guests are requested to bring their own towels for use with the hot tub. Murton Grange provides an ideal base from which to explore the surrounding area where there are stately homes at Castle Howard, Beningbrough Hall and Sledmere House. Quaint market towns at Malton, Helmsley and Pickering and the famous steam train which travels through the stunning scenery of the North York Moors. The coastal towns of Filey, Scarborough and Whitby are all within an hour’s drive. The shop is 3½ miles from Murton Grange near York, with the pub and restaurant 2¼ miles from Murton Grange. (Refs UKC3177 [Farmhouse], UKC3178 [Cottage 1], UKC3179 [Cottage 2], UKC3180 [Cottage 3], UKC3181 [Cottage 4], UKC3182, UKC3183 [Cottage 6], UKC3184 [Cottage 7] and UKC3185 [Cottage 8] can be booked together to sleep up to 68 people!). Cottage 5 is all on the ground floor. Living area: With Freeview TV, DVD player, CD player and single sofa bed. Bedroom 2: With 3 single beds. Gas central heating included. Sitting-out area with garden furniture. Private parking for 4 cars. All properties: Electricity, bed linen, towels and Wi-Fi included. Travel cot and highchair available on request. No smoking. Holidays at Cottage 5, Murton Grange run from Tuesday to Tuesday. Pets allowed at Murton Grange - Cottage 5. For a better idea of where Murton Grange - Cottage 5 is, you can see Murton Grange - Cottage 5 on the map below. Murton Grange - Cottage 5 is in North Yorkshire; should you be on the lookout for a special offer, you can find all the special offers in North Yorkshire. It's always worth checking to see what is on offer at the moment. 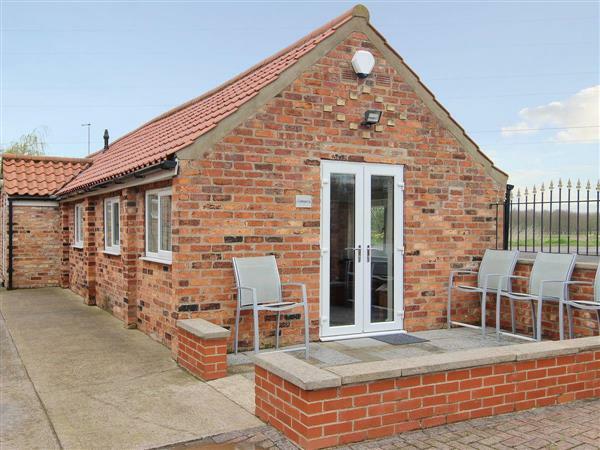 Do you want to holiday near Murton Grange - Cottage 5 (UKC3182), you can see other cottages within 25 miles of Murton Grange - Cottage 5; have a look to find your perfect holiday location.